Portland is a city known for its cultural freedom, blend of different communities and the way the people celebrate life in this part of the world. Portlandia Mermaid Parade is a grassroots artistic event that has been brought forward to celebrate the city’s love to its rivers, the enchanting history and water-myths related to it. There is a little history behind the name. The parade has been given the name Portlandia to honor the river goddess sculpture that was created by Raymond Kaskey. The sculpture is present currently at the entrance of the Portland Building located Downtown. Being the second largest copper repoussé statue in the country, second only to the Statue of Liberty, Portlandia holds great significance in the hearts of people. The parade is also a tribute to the professional mermaid trainers. 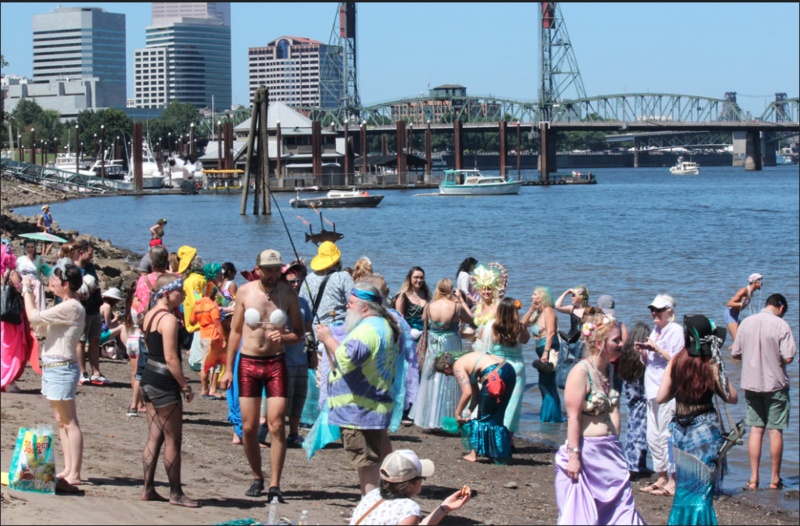 A living culture that thrives in Oregon and throughout the Northwest region, professional mermaid trainers have been bringing the magic and mythology to life over all these years. 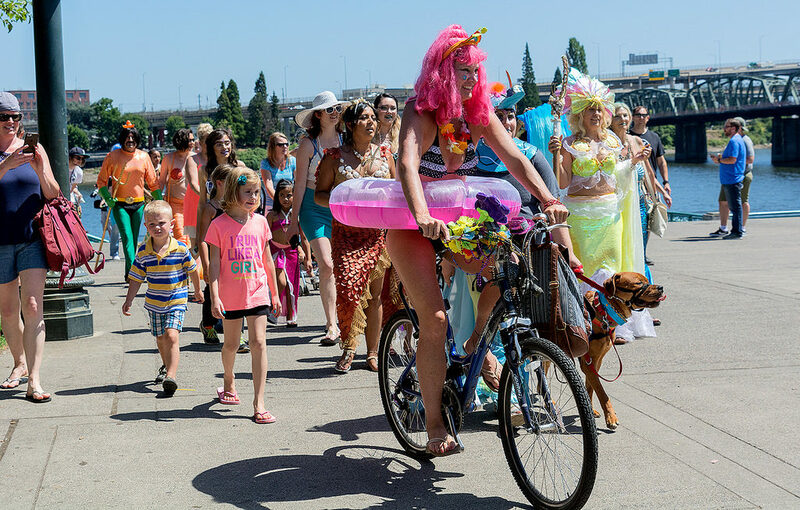 Recognizing the struggles of these entertainers, the hardship many have had to go through, Portlandia Mermaid Parade aims to help them come out of the shell and express their creative gimmicks. The event is looked upon as a peaceful event, organized with the motive to make people versed with the artistic talent of these amazing entertainers, bring out the myths and legends that they have stored with them throughout the history along with the symbology and spiritual values. As an organized gathering, this artistic parade celebrates the history of mermaid entertainers that has so much to offer anyone and everyone. 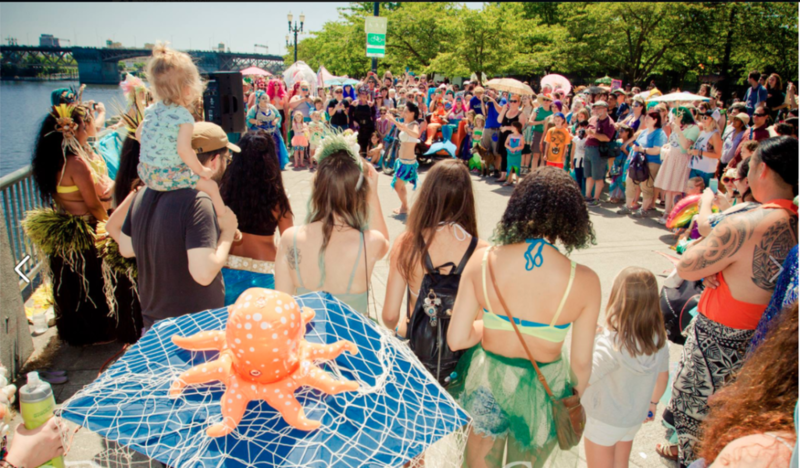 The Portlandia Mermaid Parade was started with the mission to inspire people to believe in magic. It aims to let them know that there is a hidden child in each one of us, who must believe in magic lest life on this planet would disappear. 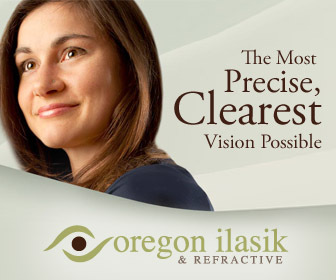 It aims to bring a transformation that people can embrace and become happier in life. An exciting thing about the event is that it is free-to-enter for everyone and there are no vehicles allowed. So, in a way it is also an initiative to work towards environmental conservation as well. Revitalizing the artistic energy of the town, the parade comes as an opportunity for the creative people to embrace the platform, showcase their talent and express themselves! The parade is going to be held at the Japanese American Historical Plaza, 2 N.W. Naito Parkway, Portland, OR 97209 on 29th of July, 2017. It will begin at 12:00 PM and will run for four hours i.e. until the clock strikes 4:00 PM. To check out more about what you can expect to get at the parade, the events that are going to happen, the contests and everything else, you can visit the official website http://www.portlandiamermaidparade.com/. So, are you ready to celebrate the love for the rivers in mermaid style? Want To Experience The Eeriness Of Oregon Ghost Towns?